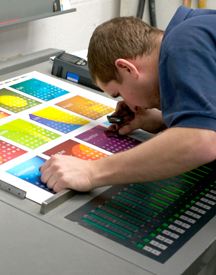 Several years ago, a quiet revolution occurred in the printing industry with the debut of the DI Digital Offset press, and AccelaGraphics was one of the first to take advantage of the features of this amazing machine. The DI's chemistry-free plate burning process is good news for your job's speed and quality, and good news for the environment as well. The reduced setup time and print run speed make it a true full-color workhorse, and the quality of the finished pieces blows away most older, larger presses. In today's just-in-time, no-inventory workflow, you'll find our DI Press a major component in producing your job quickly and accurately. Call us at 508-366-5999 to find out how reducing inventory and printing just what you need, when you need it, can make sense for your bottom line.